These rides do not include food and will require waivers of liability. All rides are $6 to defray costs. Discover 250 years of flight in a guided bicycle tour along the Anacostia River trails, from the first balloon flight in America to intriguing 20th century inventions and industry. The ride will be a flat 10 mile loop with snacks provided; some riding on quiet streets, but mostly off-road, paved trails. Persons 16 & under must be accompanied by an adult. Program led by College Park Aviation Museum. Departs from College Park Aviation Museum at 1985 Cpl. Frank Scott Drive, College Park, MD. Advance registration is required. Use ParksDirect or call 301-864-6029. Explore the far-reaching Calvert lands through the lens of the area’s most important waterway. This casual guided bike tour will make stops at significant historic markers and Anacostia vistas along the way. Program led by Riversdale House Museum. Departs from Riversdale Visitor Center at 4811 Riverdale Road, Riverdale Park, MD. Ride on the Trolley Trail to see where the rivers, roads, and rails have all played a major part in the history of the Heritage Area. We will start with a short video of the Number 83 streetcar while we prepare to ride. Riders will see the remnants of the trolley line, cross the old B&O Railroad line, and see the Rossborough Tavern before returning south. Program led by Maryland Milestones and departs from the Heritage Center at 4318 Gallatin Street, Hyattsville, MD. Trace the route from Riversdale House Museum to the Battle of Bladensburg battlefield to the Dueling Grounds in Colmar Manor where we will reenact a duel. Some short time on side streets is necessary. Program led by Maryland Milestones and departs from the Heritage Center at 4318 Gallatin Street, Hyattsville, MD. The Washington, Baltimore, and Annapolis interurban was an important connection between the three communities. Additionally, this streetcar style system also connected Glenn Dale, the historic community of Lincoln, and Bowie. Riders will see the historic route, the planned crossing of the Patuxent River, and visit the Bowie Railroad Museum. 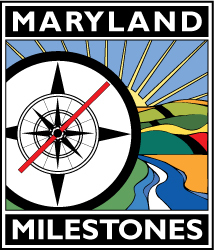 Program led by Maryland Milestones and departs from Bowie MARC Station. Greenbelt is a unique planned community built in the 1930s during the Great Depression. Built from land owned by the US Government and constructed using high planner ideas, the community has continued to flourish. Riders will depart from Greenbelt Metro Station, will visit the Greenbelt Museum, the Greenbelt Community Center, and ride into the Beltsville Agricultural Research Center. Program led by Maryland Milestones and departs from Greenbelt Metro Station.